The team at Timberline Veterinary Hospital is committed to your pet's health. 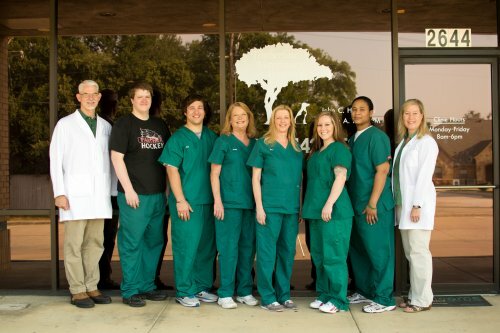 Grapevine based Timberline Veterinary Hospital excels in the science of Veterinary medicine since it was founded in 1999 by Dr. Richard Singleton. Dr. John Hill and Dr. Melinda Hill purchased the practice in December 2011 and continue along with our staff to provide excellent and compassionate veterinary care in the Grapevine area. Timberline Veterinary Hospital is a full-service small animal hospital dedicated to the health, happiness and well being of your pet. We provide friendly, informative, and supportive services for you and your pet, while maintaining a superior working environment for our employees. Timberline Veterinary Hospital offers the Grapevine animal community medical, surgical, and dental veterinary care. With an in-house pharmacy, laboratory, radiology facility and surgical suite, our facility enables you to make one stop for your pet's health and medical care. We also offer the ease and convenience of an online pharmacy. We are open for appointments during normal business hours. Visits with the doctors are by appointment only. Check out our Facebook page for recent postings. Drs. John and Melinda Hill are excited to announce a new approach to providing your pet with the best possible care – our Annual Wellness Plans. They work by letting you choose the level of services for your pet at a substantial discount while allowing you to pay for those services for a low monthly fee. Dental care and spay/neuter procedures can be included as well. In addition to the services provided by each plan, pets with an annual wellness plan have unlimited, free office calls. Puppy and Kitten wellness plans are also available. Please feel free to call at 817-442-0525, e-mail to timberlinevet@verizon.net, or drop by if you have questions or would like to enroll. Click here to view the Canine Wellness Plan. Click here to view the Feline Wellness Plan. Click here to view the Puppy Wellness Plan. Click here to view the Kitten Wellness Plan. "It's been a few years now, but we took our cat here to get him declawed. I was so worried about having the procedure done, especially since he was 5 years old. However, everything turned out fine. Our kitty recovered quickly, without any complications from the surgery, even to this day. The staff took the time to make sure we understood how to administer the medicines."